For Baselworld 2015, Ulysse Nardin have already brought out some great pieces such as the new Anchor Tourbillon and FreakLab. This latest piece is no exception. Introducing the Ulysse Nardin Hourstriker Oil Pump. 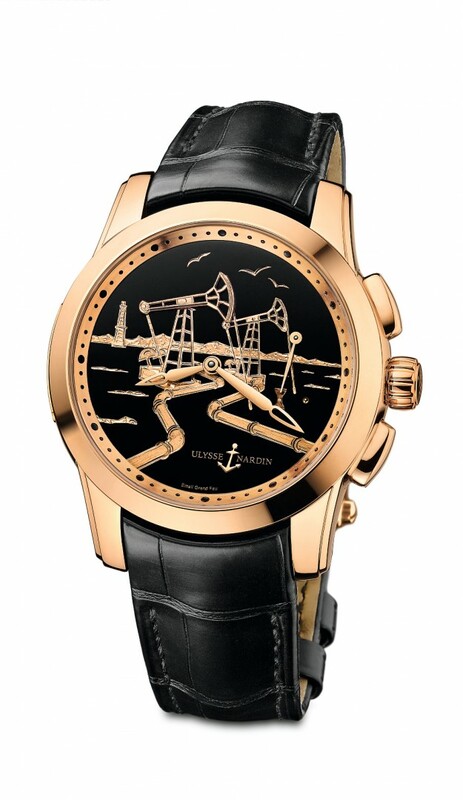 The dial depicts the magnitude of oil fields and the harmonic rhythm of their oil pumps at work, unearthing fuel to power the world. The dial is delicately hand-engraved in gold, and enameled in black. As a first step, the highly specialized engraver handcrafts the form of the gold plate, defining the thickness of the cells and shaping the lifelike pictures. Then, the master enameler fulfills the enameling process using genuine black enamel. In this method, cavities in a thick metal surface are formed, filled with moist powdered enamel and fired until it melts. When the surface cools, it is sanded by hand to remove excess enamel and polished to allow its true brilliance to break through. The plate is then returned to the engraver for their expert finishing touch. The arms of the oil pumps are Jaquemarts. These animated figures move up and down in concert with the sound of a gong striking the hours – on the hour and on request. The oil pumps move in sync with the hammer hitting the gong. Although a very complex mechanism, the Hourstriker is simple for its wearers to function. The striking mechanism can be activated or deactivated by simply pressing pusher one. When the striking indicator is pointing towards the hour glass (on the left), the striking is deactivated; if aimed towards the point, the striking mechanism is activated. A limited edition of 18 pieces in rose gold and 18 pieces in platinum.